Due to the fundamental role of differential equations in science and engineering it has long been a basic task of numerical analysts to generate numerical values of solutions to differential equations. Nearly all approaches to this task involve a "finitization" of the original differential equation problem, usually by a projection into a finite-dimensional space. By far the most popular of these finitization processes consists of a reduction to a difference equation problem for functions which take values only on a grid of argument points. Although some of these finite- difference methods have been known for a long time, their wide applica- bility and great efficiency came to light only with the spread of electronic computers. This in tum strongly stimulated research on the properties and practical use of finite-difference methods. 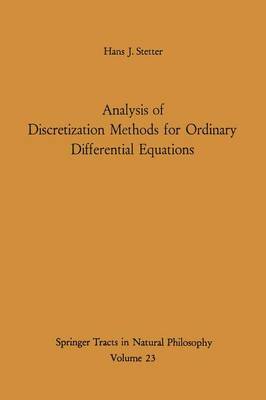 While the theory or partial differential equations and their discrete analogues is a very hard subject, and progress is consequently slow, the initial value problem for a system of first order ordinary differential equations lends itself so naturally to discretization that hundreds of numerical analysts have felt inspired to invent an ever-increasing number of finite-difference methods for its solution. For about 15 years, there has hardly been an issue of a numerical journal without new results of this kind; but clearly the vast majority of these methods have just been variations of a few basic themes. In this situation, the classical text- book by P.